North Dakota is one of the oft overlooked states in the United States. There's not much in North Dakota aside from wholesome people and vast sweeping plains, that's what the majority think anyway. The truth is, North Dakota is more than just endless plains, it has its scenic spots. The problem is that they are well hidden and one has to go there to discover them. 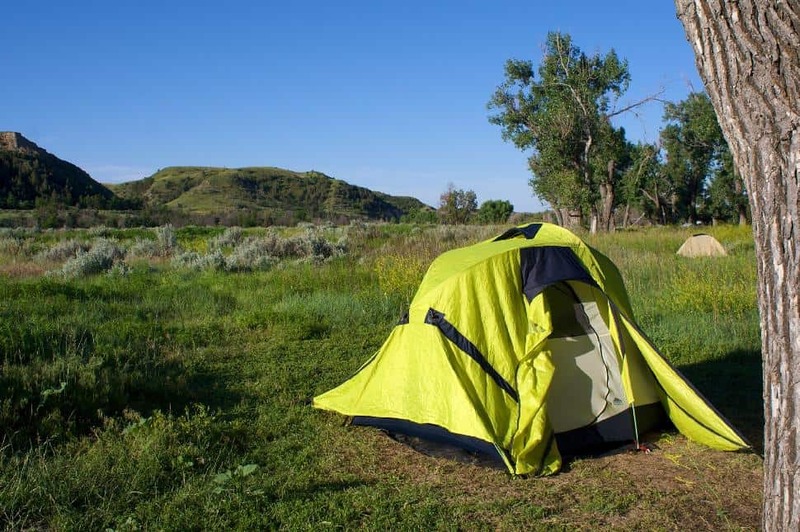 However, where there are beautiful lakeside forests and rolling small mountainous hills in North Dakota, there is almost always a quality campground nearby. For those that want to discover some of the splendor in North Dakota, here are some good places to set up base camp. Nestled on the shores of one of North Dakota's largest lakes is the Devil's Lake State Park. Many Native American legends note great warriors drowning in the depths of this lake due to some great sea monster, and eventually the name Devil's Lake evolved from the native name. However, it's hard to believe any ghost stories in this area once camper's get here. It is a slice of sheer wonder. The area around the lake is perfect for hiking, biking and horseback riding through the rolling plains and lightly forested areas. However, it attracts visitors who are far more interested in boating around its waters or fishing for the abundance of walleye, perch and bass that lurk below. There are several camping areas around Devil's Lake, but the primary campground is located on Graham Island. On this large island, camper's can really get away from it all. The campground is located near a small, but sandy beach and provided shade and privacy by a peaceful forest. While there is a road that leads out to Graham Island, there is also a boat launch nearby for those that want to dock or launch one near the campground. While the Badlands National Park that everyone knows and loves is in South Dakota, North Dakota has its own special section of badlands. Little Missouri State Park and its campground are smack dab in the middle of it. The campground is located in the woodlands portion of the park, with sites well spaced out and private. However, it is just minutes from the hiking trails that explore all the buttes, crevices, outcrops and ravines of the badlands area. This campground is close to some of the most awesome hiking in the entire state so visitors should take advantage of that. For those with tired feet, there is also a horseback outfitter located nearby the campground where visitors can ride through the horse trails in the woods, prairie and badlands. Those with their own horses can bring them and corral them at the ranch while they camp in the area as well. Turtle River State Park is a lovely recreational area that is located along the wooded banks of the Turtle River. The campground in Turtle River hosts both developed and primitive sites, which are perfect for every sort of camper. It lays in the denser parts of the forest just a couple of hundred feet from the river. The developed sites are beautiful and well-maintained while the primitive sites are well spaced apart, providing excellent privacy to enjoy nature. Although the river isn't great for fishing, there are a number of trails throughout the state park that are perfect for hiking and mountain biking. These trails lead through the dense forests, lonesome prairies and vast wetlands of the state park. There is also an abundance of wildlife in the area as well. It is unlikely that campers will go home without seeing one of Turtle River's many resident beavers, raccoons, woodchucks, deer or even a moose or two. For those that visit in the winter, this state park is also a hot spot for sledding and snowshoeing. Right on the banks of the mighty Missouri River is that Downstream Campground. This campground is also nearby one of North Dakota's most popular lakes, the Sakakawea Lake. Water enthusiasts flock to this campground year-round to swim in the lake or boat around the area. However, the major activity here is to come and fish for huge northern pike, walleye and bluegill. There is also Chinook Salmon in the lake, making Sakakawea the only body of water in the state to host the species. The campground is located in an open grassy area and is quite popular, so campers probably won't get the privacy they really want. However, this grassy area dotted with hardwood trees provides excellent views of both the lake and the river. Campers that don't like crowds should come in the early spring or late fall months as in the summer time, this campground fills up quick. For camping in the summer months, reservations are a must. For visitors that want to take a side trip, the Garrison Dam lies to the west of the area and the Garrison Dam Fishery is just minutes away. The fishery is open for tours and hosts five 400-gallon aquariums so visitors can view the fish. Eggert's Landing Campground is located on North Dakota's other popular lake, Ashtabula. Whereas Lake Sakakawea was wide, open plains, the campground on Lake Ashtabula is thick forests. This manmade lake was made when the Baldhill Dam was built on the Sheyenne River and has since become one of the most scenic river valleys in the region. Visitors come here for decent boating and fishing during the summer and ice fishing and cross country skiing in the winter. The campground is nestled in the thick forests and the sites are well spaced, leading to optimal privacy. While the lake, boat launches, swimming beaches and fishing piers are all within walking distance of the campground, it is also close to some other great activities. Campers can hike or drive the nearby 63-mile Sheyenne River Valley National Scenic Byway or hike 35 miles of the North Country National Scenic Trail. Between the fishing and the hiking, campers will not want for activities at this campground. Do you love camping in North Dakota? What is your favourite camground located?